As you may recall, the four characteristics of diamond grading are Color, Cut, Clarity, and Carat. This system of grading scales, called the Four C’s, was developed by the American Gemological Association in the 1940’s. Typically, the scale is meant to stand on its own, with the diamonds graded most highly on these characteristics being the best available (and coincidentally, the most costly). I don’t think that it’s necessary to have the deepest pockets to get a diamond that will look absolutely stunning on her hand. So I like to think about nuances that we don’t usually hear about, and I’m happy to share my thoughts with you. The truth is that there is another way to look at diamonds that frees you up to get the diamond that is “perfect” for you, without your having to break the bank for “perfection” across the scales. Of the Four C’s, the ones with the most impact on how the diamond looks on her hand are color and cut. These are what govern the beauty and sparkle. I usually stick to the top colorless range of D-E-F color, but I also usually search on “G,” the top of the near-colorless range, because I may choose this for you, or suggest it to you as an option, if this diamond has other outstanding attributes. As for clarity, once you obtain a clarity level of SI1 or SI2 (or even SI3), with no inclusions visible to the unaided eye, clarity beyond that is pretty much quality you can only see under a microscope. I can get you a diamond with any specs you want, but I’m usually asked to provide a stunning diamond at a reasonable price on a unique, hand-made puzzle ring. So my goal is to save you money, without compromising how the diamond will look on her hand. One additional characteristic that makes a significant difference to how a marquise diamond looks on the hand is the proportion of length to width. What is generally considered the “ideal” ratio is 2:1 length to width, which is defined as a proportion of 2. However, any proportion from 1.85 to 2.15 is said by the diamond industry to be very pleasing. Still, no matter what guidelines are given to help you with your choice, sometimes, there are very good reasons to select a diamond outside of the suggested range. Why get a diamond with different proportions? An excellent reason can be that an extra-long marquise has the visual impact of a higher carat weight diamond. A marquise diamond with an unusually long length, relative to the width, may be a bit shallower than typical, so length accounts for a larger proportion of the gem. A marquise diamond that looks like a significantly higher carat weight is more valuable than one that looks to be its actual size. Frank, I’m really glad that you are familiar with our diamond supplier, since your company makes products for this vendor. Our diamond supplier gives truthful information about their diamonds, but their pictures, with all due respect, are definitely not up to scratch. The diamonds themselves look many times better than their images, and they consistently sparkle LIKE CRAZY, so I look for certain things in the images that give clues to a diamond’s true beauty. I will try to share some of those observations with you, now. I’ve posted below some of the available diamonds in the range you’re interested in, and I’ll talk about the various characteristics of each one. I don’t think they are all contenders for the ring you want, but several of them are. Today we’re looking for a marquise diamond in the 0.57CT to 0.63CT range. This diamond will be placed in a medium, four-band puzzle ring in 14K white gold. The only problem is that the rare 6/10 CT range that we seek usually offers very few diamonds from which to choose. That’s because diamonds are usually cut in the 1/3CT, 1/2CT, 3/4CT, and 1CT range, with precious few diamonds in the in-between sizes, especially the larger you seek. I happen to be very committed to offering the 6/10ths CT range, because it is one of my favorite sizes in almost any shape of diamond. It is prominent, but not gaudy. It looks bigger than a 1/2CT, and yet it is only priced at about 1/3 more than a 1/2CT. Diamond prices go up exponentially, and even to find a diamond around 0.70CT, the biggest we usually put on the four-band medium puzzle ring, the purse strings need to be quite a bit looser than they need to be for a 6/10CT range diamond. Today, I found five diamonds ranging from 0.56CT to 0.58CT. 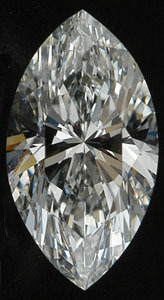 The very next diamond up the size scale was 0.70CT. So let’s look at what is available today. The important thing to know is that these are not great images. They are wholesale pictures, and they are meant to show the shape and relative proportions of each diamond. When we select your diamond and it arrives, it has to pass our inspection, first. We are super picky about the stones we puts in our rings – call it pride of craftsmanship – we won’t put just any diamond in your ring. This diamond is 1/100CT smaller than the range we’re looking for today, which is .57CT to .63CT. It’s a .56CT. It has excellent color and clarity. With a size of 7.88mm x 4.26mm, it’s proportion is 1.85. 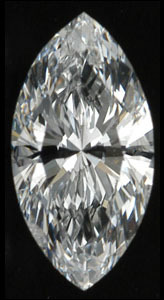 This diamond has a length more typical of diamonds in the .46 – .52CT range. It has four inclusions, and one is a cavity on the pavillion. Cavities are natural; they are good to know about, because some unscrupulous diamond sellers fill cavities with epoxy. But my thought is, why get a diamond with a cavity when you don’t have to? Other thoughts about this one: even though it is probably just the image, I tend to steer clear of diamonds with images dominated by brown and beige tones. The ring would be $3,597.00 with this diamond. I’m confident this diamond will be a beauty. The dimensions are 8.81mm x 4.26mm, which gives it a proportion of 2.06, just about right on the dot of 2. With D color, it doesn’t get any better or more colorless. It has a very good cut, with SI1 clarity. The only down side? Still 1/100CT smaller than we want, although I would like to point out that we cannot see a difference of two to three points in diamond size when we just look at two diamonds with no real means of measuring them. Dropping the size by a couple of tenths of a carat can sometimes save a few $$, although not in this case. This diamond looks exceptional to me, so it’s a true contender for this puzzle ring. This diamond, by the way, has a single inclusion, which is a crystal in the table. A crystal in a diamond is actually a diamond within a diamond. How cool is that? It’s not visible unless you have a trained eye and a microscope, but still, it is pretty awesome that this diamond has only a single inclusion, and it’s another diamond, no less! The price of this finished puzzle ring is $3,797.00. This diamond is a contender, as well, though it doesn’t appeal to me as much as # 2, above. At 0.57CT, the dimensions of 8.41mm x 4.28mm give us a proportion rating of 1.96, also very close to the magic 2. What about the slight blackness across the center? That is called bow-tie, and traditionally, we look for minimal bow-tie like this in a marquise diamond. But in the last two years, we’ve experimented more with diamonds showing more prevalent bow-tie in an image, and we find it does not affect the way the diamond looks in person. So what exactly is bow-tie? 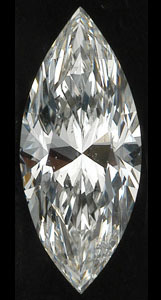 It is an artifact of cut that appears in many pictures of marquise diamonds. It’s essentially an illusion that does not appear when examining a diamond in person, unless the amount of bow-tie is extraordinary. This diamond has almost nothing in the way of inclusions, only feathers on upper girdle and pavilion. This diamond is the rare one with G color that I like to consider. At 0.58CT, and with a length of 9.52mm (4.03mm width), the proportion rating is 2.36. It has a length more typical of a 1CT diamond. It’s going to look much bigger than the 0.58CT it is on the hand. It has SI1 clarity, a good cut, and it’s closer to the 0.60CT mark. 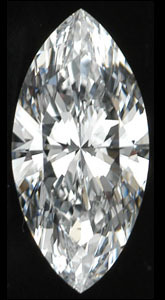 Inclusions in this diamond include a twinning wisp in table and crown, a feather on upper girdle and pavilion. The reason I tell you this, is that these are insignificant inclusions. With SI1 clarity, you can’t see any inclusions with the unaided eye, anyway, but it’s still important to make sure that there are no fracture lines, or other structural problems with the stone. I’m always happy when a diamond has few, insignificant inclusions. As soon as I locate it, I’ll post an image of a puzzle ring we recently did with a long, slender diamond similar to this one. My clients in Canada were over-the-moon about it! This diamond jumps out as a beauty to me. It’s that rare diamond that doesn’t come with specs significantly higher than the diamonds shown above. But I’m sure you can see that this one seems to have a lot going for it. With D color, it is perfectly colorless. It’s 0.58CT, very close to the magic 0.60CT mark. The proportion rating is 1.9. It has few inclusions: Feather in bezel and upper girdle, indented natural in upper girdle, none of which you’ll see without a trained eye and a microscope. Even clarity of VVS1 and an excellent cut cannot guarantee that a diamond will look gorgeous on the hand. 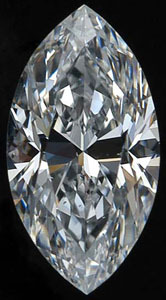 The image of this diamond with “only” a good cut, suggests it will be spectacular. True, it looks fantastic, and besides it’s beautiful proportions, top color, and structural integrity, the biggest difference between this diamond and the previous four? This one costs 40% more than the others. It’s a lovely diamond, to be sure, but is it worth the price to you? 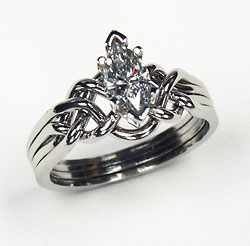 The retail price on this ring is 28% higher than our target price for a 0.60CT puzzle ring. The finished ring with this diamond would be $4,877.00. My recommendation? Go with any of these diamonds from #2 to #5. Trust your instincts and select the one that appeals to you most, with a price tag you’re comfortable with. Frank, you don’t have to choose one of these – we can wait for others to become available, but I’m quite pleased with the selection today. I hope you are, too! I also welcome inquiries about puzzle rings with any size of marquise diamond from 1/3CT up at 1-866-573-7381. Many thanks for visiting!